The other day as I was walking from the garden shed towards our house I surveyed some of our milkweed plants, hoping to find a Monarch Butterfly caterpillar. We have seen only a few caterpillars this year. That is better than last year, when I don’t remember seeing any in our yard. 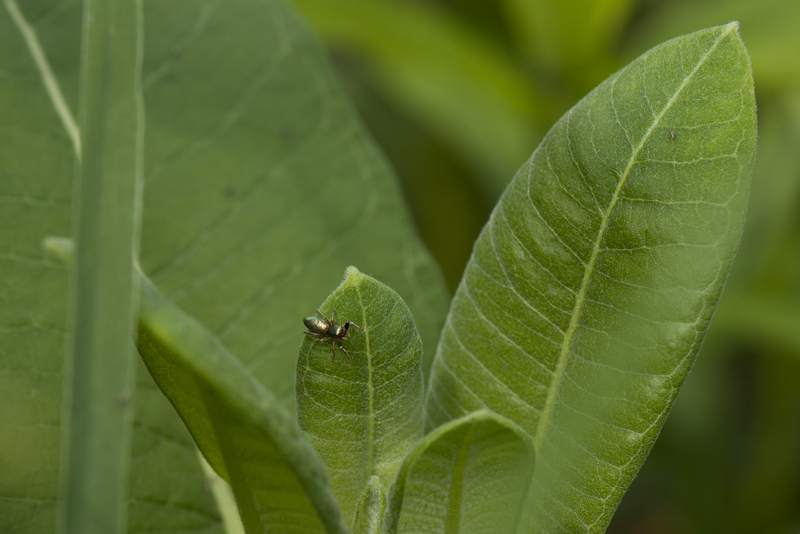 Anyway, as I checked the milkweed leaves I noticed a familiar beetle, one of the colorful checkered beetles (members of the family Cleridae). 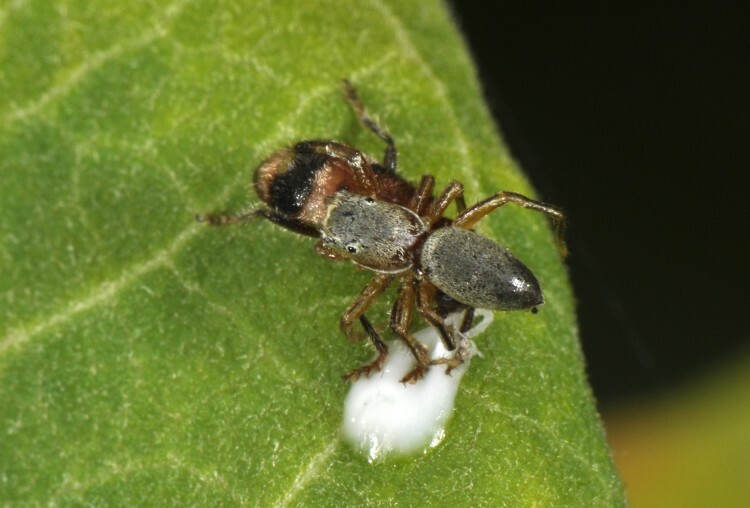 What caught my eye about this beetle is that it was evidently feeding on a patch of white gelatinous material, possibly milkweed sap. As I watched, it was approached by a spider, a little (about 1/4 inch long) male Tutelina elegans. Then something really odd happened, the spider hopped on top of the beetle. He wasn’t trying to capture the beetle, and didn’t attempt to bite it. 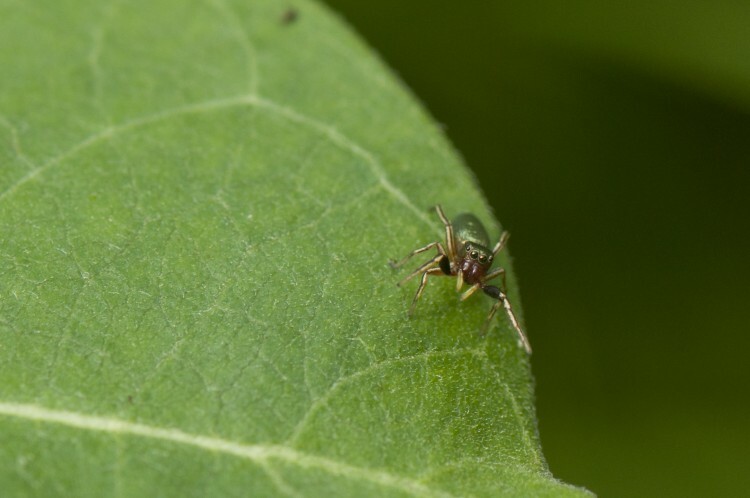 He took the position typically adopted by jumping spider males when mating! He reached over the back of the beetle, and rubbed the beetle’s belly with his palp. Then he switched position to do the mirror-image behavior on the other side. This is the typical mating behavior in jumping spiders. If this had been a female spider, the male’s palp would have been inserted into her reproductive openings, right and left one at a time. Below is an illustration from B.J. Kaston’s classic (1948) guide Spiders of Connecticut. I’ve reproduced, with permission of the publisher, the illustration of a pair of Phidippus clarus (a common jumping spider). In this diagram the male is in black, the female in outline. This is figure 2010 drawn by Elizabeth Haban Kaston. 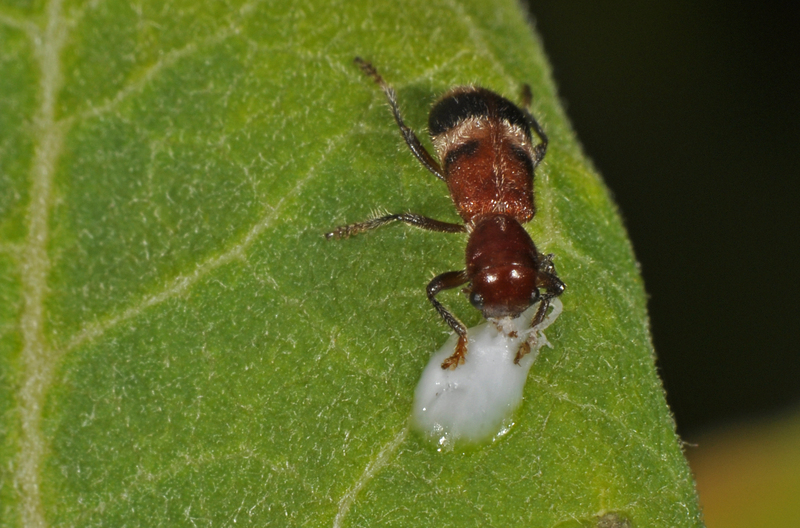 Below are several photos of the odd behavior of that male Tutelina and its beetle “friend.” I guess I can’t decide which is more peculiar, the fact that the spider is trying to mate with a beetle, or that the beetle seems not to react at all! 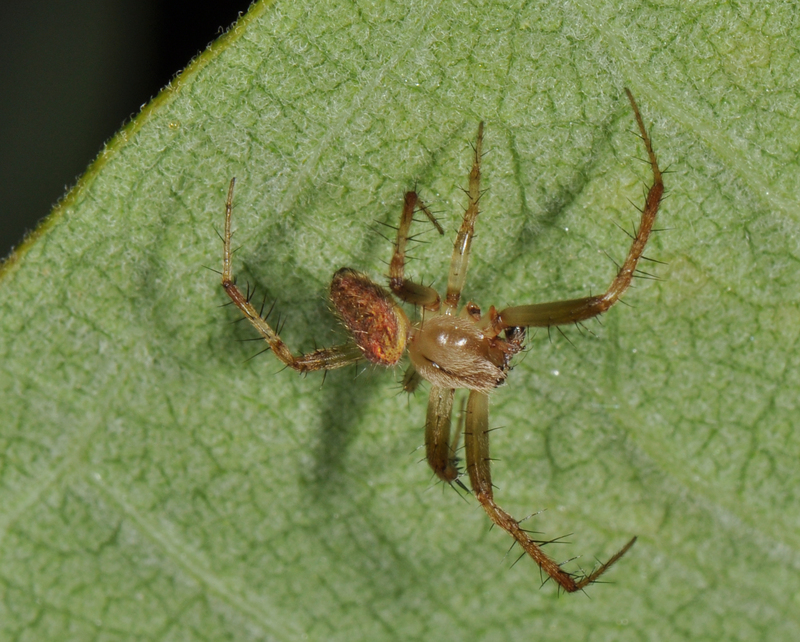 Note that this male spider is missing his left front leg. This loss may have severely limited his ability to attract a female. In this species leg waving is an important part of the courtship dance. Here is a close-up picture of a male searching for a female while waving his dramatic tufted legs. Check out the funky tufts on his head too! Throughout all of this the beetle remained motionless. It is hard to imagine what it might have been thinking. I’m tempted to speculate that the male spider’s odd behavior was influenced by his missing leg and consequent inability to successfully court a real female spider. The actual female of this species is a beautiful iridescent green, to our eyes it looks nothing like the checkered beetle. 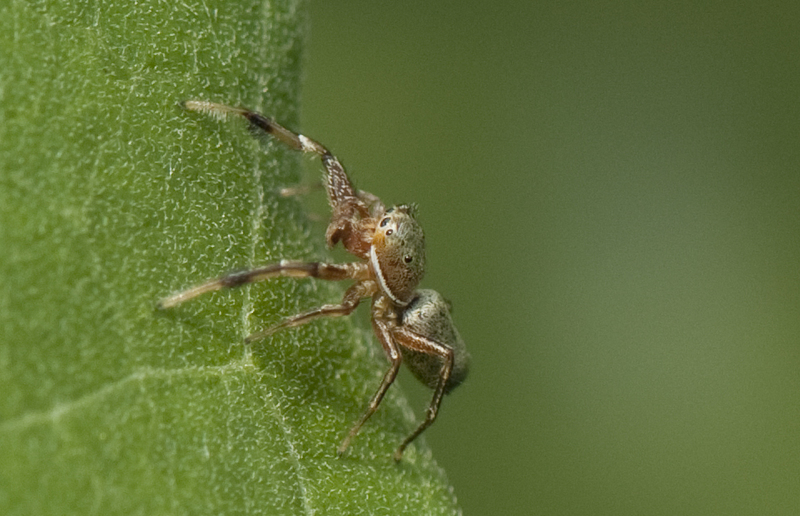 I wonder if there might be more resemblance in the vision of a jumping spider. 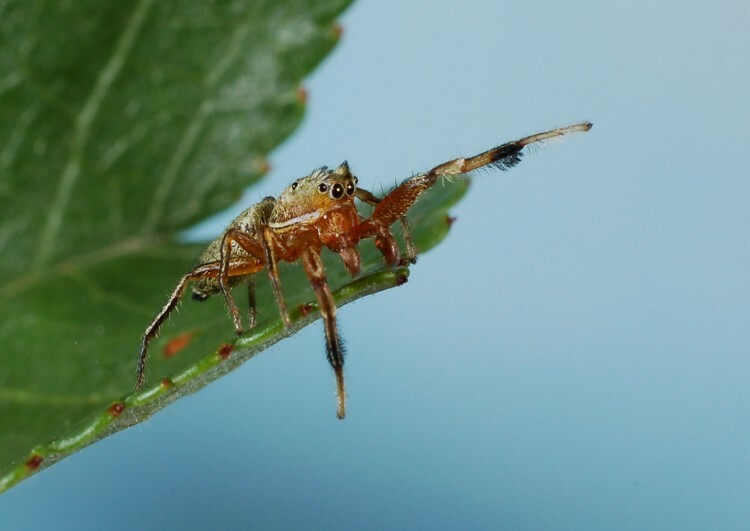 This possibility seems remote however, because jumping spiders are renown for their high-acuity color vision, an unusual feature among spiders. Of course we don’t know what is going on inside their brains. Below are two photos of female Tutelina elegans. 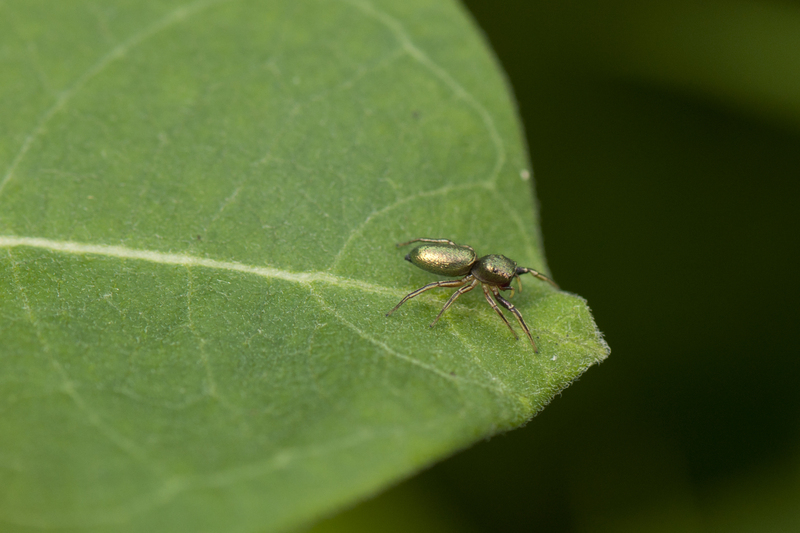 Normally these little iridescent green jumping spiders are found running among the herbaceous vegetation. The adult males seem to spend all of their time searching for females, waving their legs while they search. Here are a few of photos of males and females Tutelina from our yard. Tutelina elegans female, she can wave her legs too! 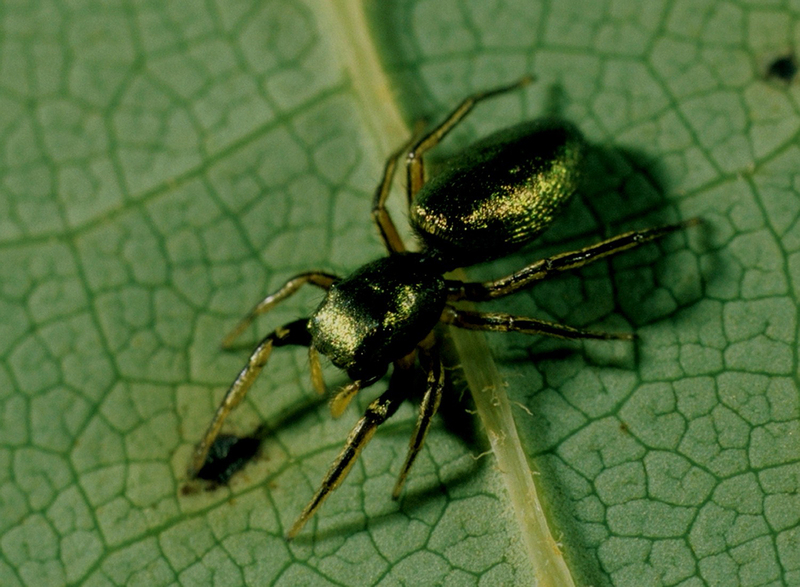 This elegant iridescent green spider is actually very common in much of eastern North America. You can find more information about it in Common Spiders of North America (p 205, plate 63). I thank George Keeney (Ohio State University) for identifying the beetle Enoclerus rosmarus. It is that time of year again, I’m starting to receive email queries about large brown spiders in webs. Typical questions ask about identification and whether or not the spider in question is “dangerous.” The messages sometimes include helpful photographs, often taken with mobile phones. These snapshots are usually good enough that I can recognize the spider as Neoscona crucifera (aka arboreal orbweaver or variable orbweaver). This species is interesting for a number of reasons. It seems to have adapted well to human-altered habitats. It is common at the edges of woods, orchards, suburban yards and even building webs directly on houses and other buildings. 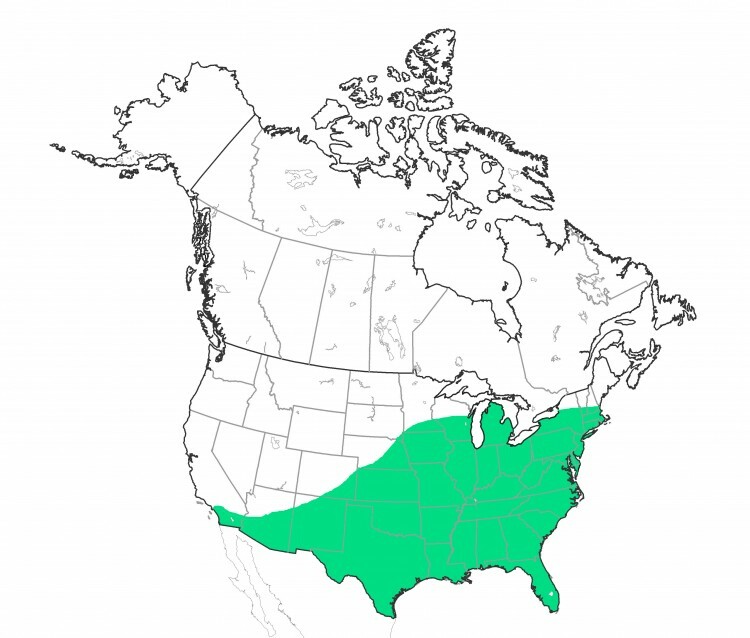 This species is common, even abundant in the east, and has recently expanded its range and abundance in the south and west. 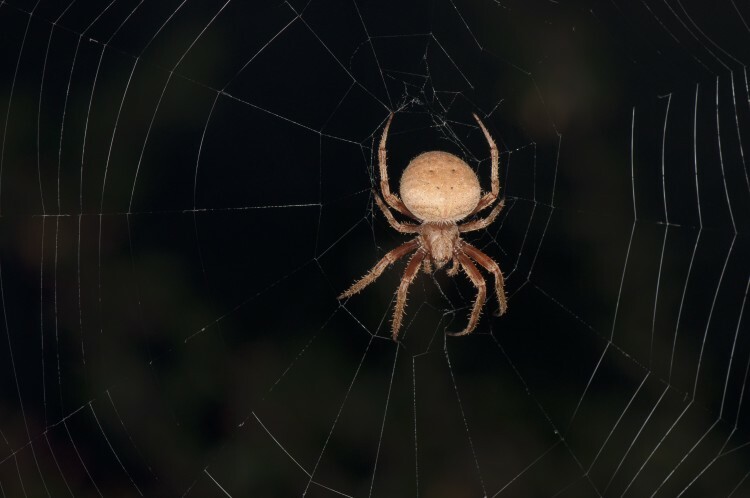 The webs of this spider are often quite large, with a frame of 3-5 feet and an orb with a diameter between 1 and 1.5 feet. The webs may be built near windows or other light sources. I suspect that they build in such situations because of the abundance of potential prey insects attracted to lights at night. 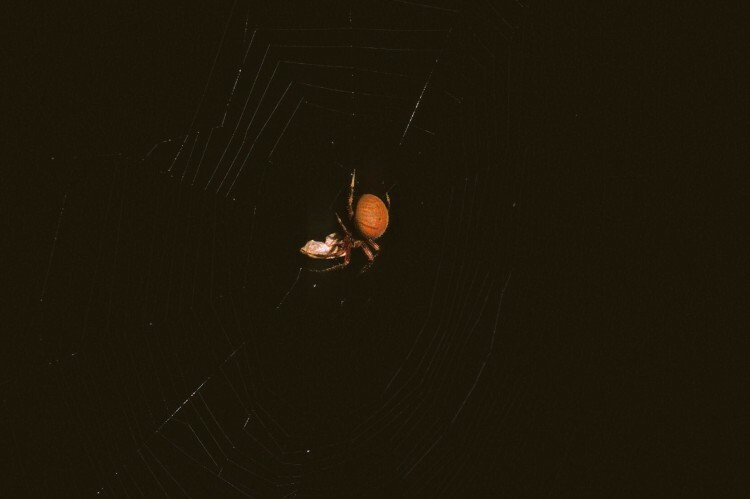 During late summer and autumn search for these spiders building their webs just after dusk. If you time it just right, you can catch them in the act. 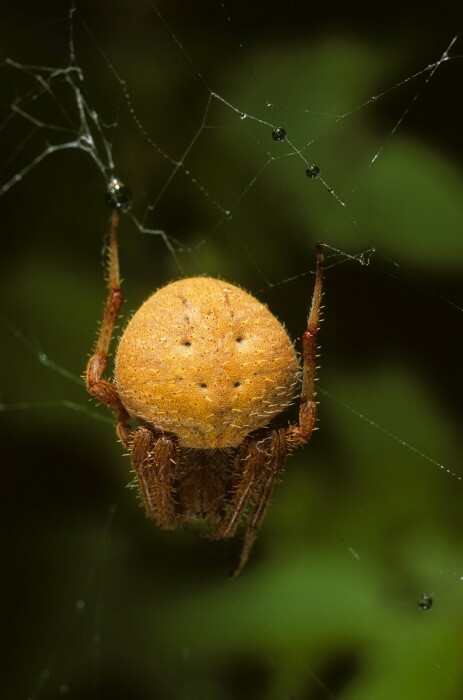 The amazing construction dance of a large heavy-bodied orbweaver is always a wonder to behold. Pay attention to the leg movements, that is how she uses her body dimensions to gauge the spacing of the spiral sticky strands, and of course the web becomes larger as she grows. 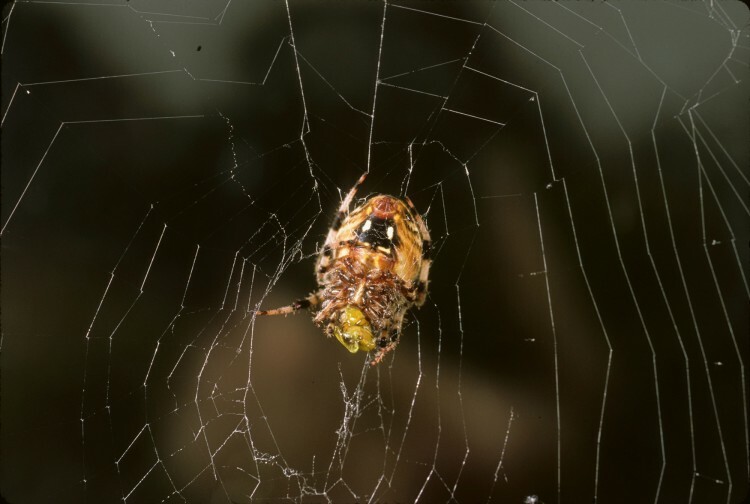 After she is done, she will typically hang, head down, at the hub or center of the web for most of the night. Typical prey are large moths, beetles, and other night-flying insects. Sometimes the spider will remain in the web after sunrise. 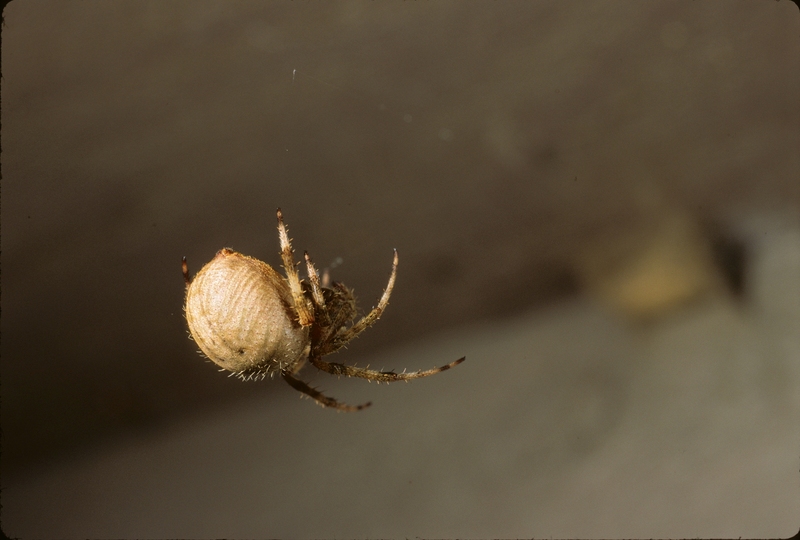 Like all of the orbweavers found in North America, Neoscona crucifera is considered harmless to humans and pets. They are shy spiders and will either rapidly retreat, or perhaps drop from their web if disturbed. In my experience they do not bite humans. Like most spiders, they are venomous, but they employ their venom against insect prey. 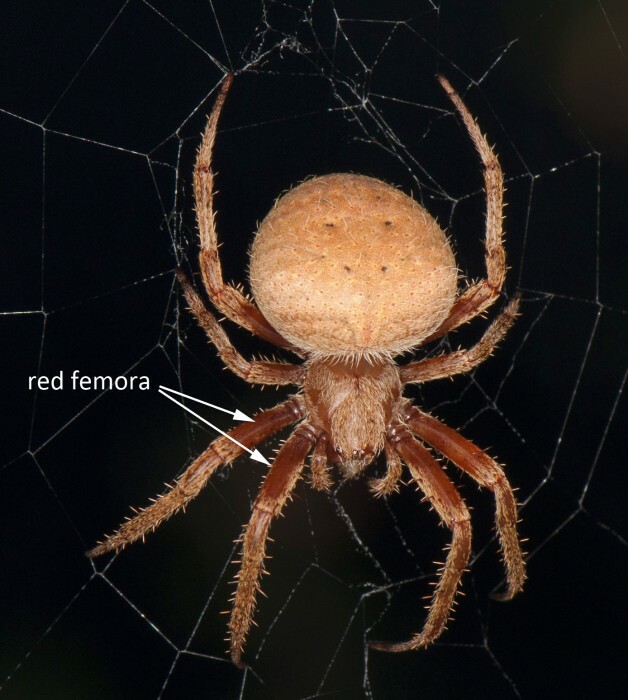 One dramatic feature of the members of the orbweaver group (Family Araneidae) is the pattern on the belly (ventral side) of the abdomen. Most of them have a central black spot, usually nearly rectangular. At each corner of the black area are a series of pale (white, cream, yellow) spots. These spots can be shaped like a comma, or nearly round. The pattern of a black patch with such conspicuous spots is often mentioned by people when they see this spider for the first time. Sadly, they are not too useful in identification because some variant or another occurs in many species. For example, each of the four members of the genus Neoscona in Ohio include this feature. 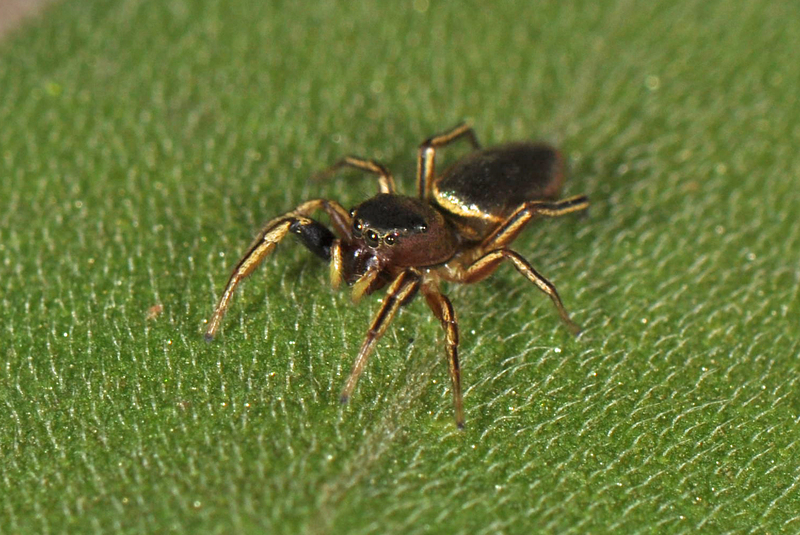 Immature individuals of this spider emerge in the late spring, but they don’t become large enough for most people to spot until summer. By late summer they are hard to miss. The individuals that are most often noticed are females, which can be large. 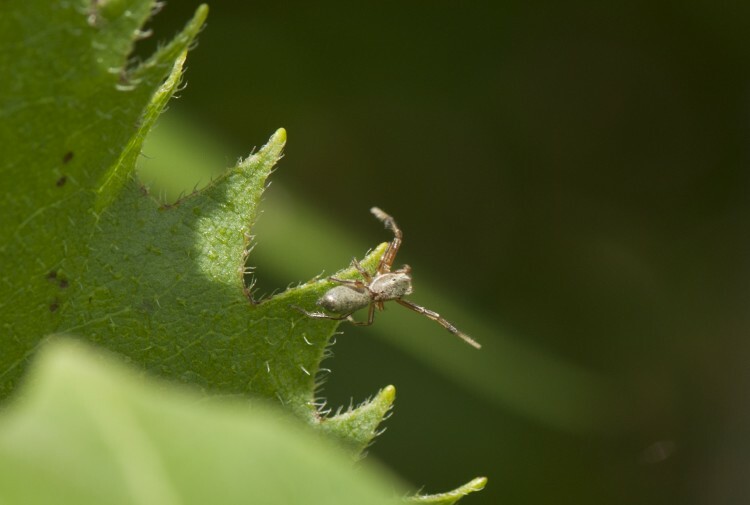 Some have a body length of about 20mm (3/4 inch) with a leg span of 1.5 to 2 inches. 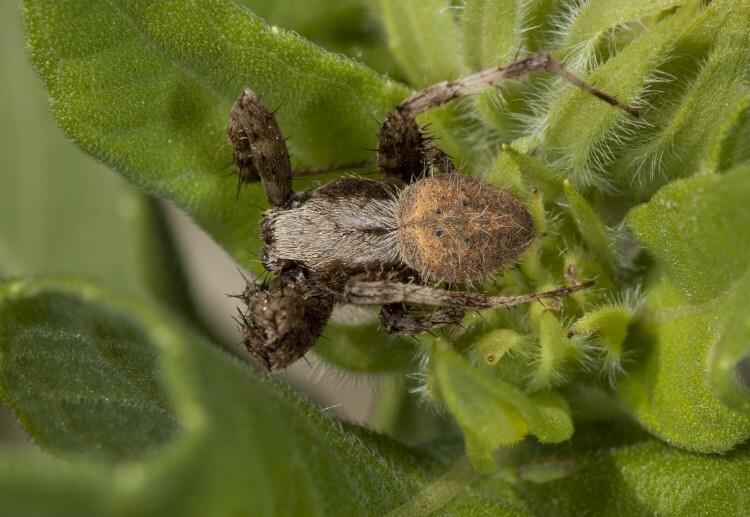 One of the most remarkable things about these spiders is how extremely variable they are. Some are plain, with a faint pattern on the abdomen, or no pattern at all. Others can show a dramatic cross-shaped mark on the abdomen, with or without a series of dark markings. Such variation doesn’t seem to be geographic, instead it is polymorphism that can sometimes be observed among several individuals in one locality. In addition to variation in pattern, the base color varies from orange, through reddish brown to a plain brown or tan. The femora (large segments of the legs nearest the body) are usually orange or red in color. 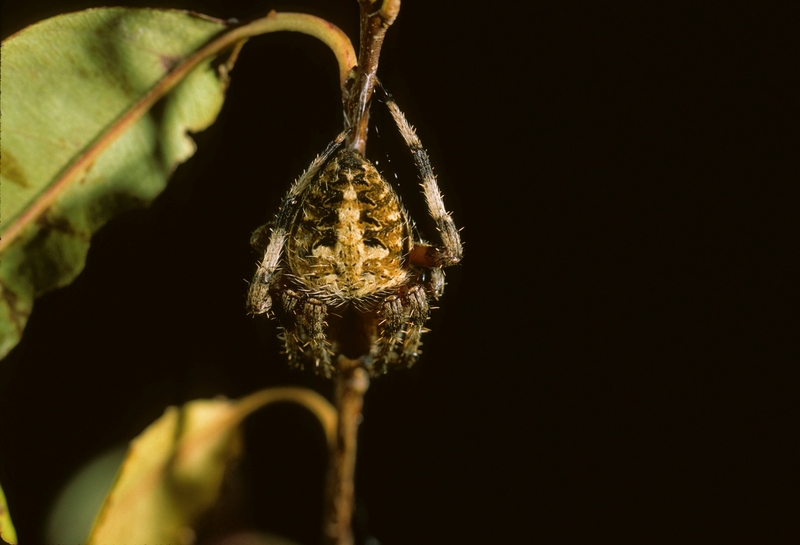 This can be seen when the spider has its legs completely spread, and may not show if the spider is in its defensive crouch. The males can also be variable in color and pattern. They typically have a smaller body than the females, with proportionately longer legs. After reaching maturity, the males abandon their webs and wander in search of females. Perhaps because of their smaller, slender body, or leggy look, the spines on their bodies seem more prominent. These wandering males may accidentally enter houses. I have records of wandering adult males here in Ohio between 11 August and 11 September. By the late autumn, the females have mated and are fat with eggs. They will construct one or more silken egg cases containing hundreds of eggs. These eggs survive through the winter and emerge once the weather becomes consistently warm in late spring. My records of adult females in Ohio extend from 15 June through 2 December. Most will perish with the first hard frosts in October and November. 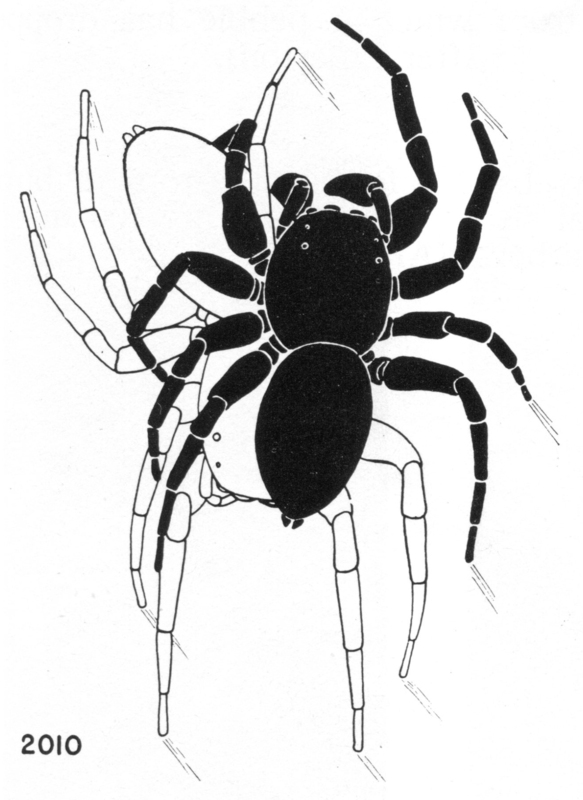 You can find more information (p. 99) and illustrations of this species (Plate 15), and its relatives in my Common Spiders of North America.